Humans are changing Earth on a massive scale. The Anthropocene is the proposed name of geologic epoch to mark the era when human activities began to have an observable impact on Earth's geology and ecosystems. Extract and process innumerable tons of rocks and minerals. 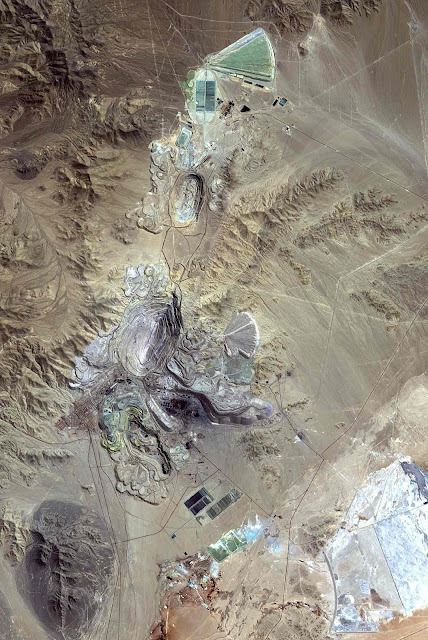 A satellite image of Chuquicamata, the largest open pit copper mine in the world, shows the surface impression of moving, extracting, and processing countless tons of rocks and minerals for over a century. The Holocene is the name given to the geologic epoch spanning the last 11,700 years since the ice age. Scientists seemed poised to declare the end of the Holocene. We now exist in a geologic epoch of humankind’s making. The consequences of human activities on Earth’s geophysical processes are yet fully realized. 6 Ways We’re Already Geoengineering Earth, Brandon Keim 23 March 2010. Satellite Eye on Earth: August 2016 - in pictures, The Guardian.